Our Quick Beauty facial is specifically put together for busy people on the go, and for people who want to put makeup on right after the facial. It is uniquely designed to give maximum results in minimum time, and is formulated to refresh, and renew and revitalize dull skin. This treatment works for all skin types and skin tones, and reveals a more youthful, and healthy glowing skin. This facial is different from all the other versions Shanette offers, and it is not suited for acne or breakouts or blackhead removal. Acneic skin needs a lot more to look better than what this facial offers, and this facial does not include extraction. 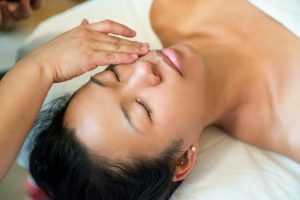 This quick beauty facial includes cleansing, a gentle exfoliation, no extraction, and a quick mask, and we finish with our organic stem cell serum and moisturizer so your skin will be ready for makeup and will not be red afterwards, and, if you want, you can add on a 30 minute LED light therapy treatment for even better results. It is a quick facial, great to have before an event or just a quick fix in between your regular facials to make you feel better, and you can wear makeup right away and show off your dewy smooth complexion.